For over 35 years FMF has delivered superior power and performance to motorcycle enthusiasts around the globe. FMF mufflers are developed over years of championship offroad racing. FMF Racing FMF spark arrestors, exhausts, and mufflers are made in the USA from the highest grade aircraft-spec materials such as titanium, stainless steel and carbon fiber components. 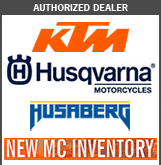 Call us at 1-888-284-4588 for sale prices and availability on FMF applications not listed below. We can usually have your FMF pipe shipped directly from a warehouse near you. Over the decades, FMF seen an amazing transformation in the world of motorcycles and ATVs. The progression of the technology is one of the challenges that keeps FMF going. FMF was there in the days when the single-shock and water-cooled engines were huge innovations and they're glad to be here now for the aluminum chassis and electronic fuel injection. Their goal will never change - take the most advanced machinery to its limit by building the world's best performing exhausts. And its a fact, they build every exhaust by hand from start to finish right here in the U.S.
At the end of the day, there is always one major force keeping them motivated throwing a leg over the bike and heading for the trails or the track. Their biggest reward for is knowing they're helping customers get the most out of their riding experience. They still ride every chance they get so they never forget why they got into this business in the first place. History - FMF Racing (Flying Machine Factory) was one of the first aftermarket motorcycle manufacturers, having been started by Don Emler in 1973. From its humble beginnings in Emler's garage, FMF Racing has become 1 of the leaders in manufacturing exhaust pipes, making a number of different pipes for motorcycles and offroad vehicles of all types.